Another excellent experience! Dr Clint, Ashlyn and the front office team are compassionate and genuine caregivers. Dentistry can be anxious experience, especially for kids. Ashlyn was patient, courteous and helped place my son at ease. 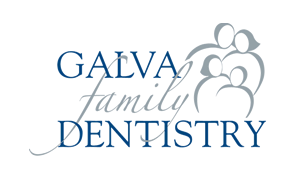 Highly recommend Galva Family Dentistry for a professional experience with highly experienced employees. I had to have 9 teeth pulled toda (wisdom teeth and surrounding teeth. I was really scared and horribly terrrified but with the nurse and Dr. Martin I felt so safe. They really mean it when they say you'll wake up and wonder if it's done already! No pail at all 9 hours later! Thank you! Friendly staff and always there if you need anything after treatment. Great as always. Have never had good experiences with dentists until I came here! Staff is amazing and truly cares about their patients! Thanks for calming our fears and being such great providers. Always, thorough and painless. Personable people from the front desk to the back. Glad to have them hear. So friendly and great at what they do! They are a wonderful group of people. They are always professional yet kind and courteous. The dental work is the best I’ve seen. If you're looking for the best dentist around, stop right here! They are thorough, friendly and most importantly, my girls feel comfortable here! I won't go anywhere else! Dr. Martin removed my wisdom teeth and was very kind and answered all of my questions. He even called the next day to see how I was doing! Dr. Bialobreski filled a cavity for me and was really understanding when part of it fell out, he got me in the next day and re-did the filling. The rest of the staff is always friendly and smiling, and I'm not just saying this cause I've known most of them my whole life! I didn’t have to wait very long and the staff were very courteous! They are always happy to see you, quick, and professional. The whole family loves Dr. Clint!!! 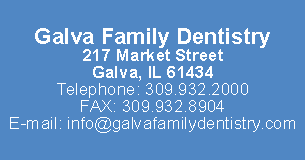 I always give Galva Dentistry 5 stars!!! They are the best!!! Today was the first time I have been to this dentist and I can say I have now solved the problem who was gonna be my new dentist.Will be using this one always. After looking for what seemed eternity we found GFD. The doctors and staff are really great. We are now leaving Illinois(which I recommend to all residents) and will have to find a new place. These folks at GFD are THE BEST. I do not like going to the dentist so for me to give them 5 stars is a big deal! Everyone is very friendly and professional. They have you in and out quickly and do a great job! Only dentist Office I will go to. My entire family goes there. Even my grandchildren. Great place! Always treated with compassion and they work great with kids. We are very pleased with the quality care and friendliness of all of the staff. Going to the dentist has never been my favorite thing to do but Dr. Martin has put me at ease. Modern, up to date equipment...they can do almost anything at their office. You don’t have to be referred elsewhere for oral surgery. Amazing staff. They are wonderful with children and adults! I have a terrible fear of dentists!! I have never been so at ease as I was here. I have even made a future appointment and that’s something I have never done!! Great people! I was amazed and delighted! Beautiful office, friendly and professional staff, great prices! What’s not to like? Amazing atmosphere and all were so welcoming! I feel lucky to have gotten here. I would recommend this office to anyone that is shopping around fir a new dentist. Best dental experience I have ever had. I have always been very apprehensive about dental visits because they had always hurt badly! Eveything went exceptionally well! Everyone was very friendly and I no longer have to freak out about going to the Dentist! Yay!!! My daughter and I had a great visit this morning! They all made her feel very special, couldn’t be happier! I can't help but think how lucky I am to have a dentist office in my hometown that is so knowledgeable. There isn't a single thing these folks can't do! I hate to say I am resistant to change but this place has evolved into an amazing facility with the best staff! Thanks for you all you!